Cool! Save an average of 20% on ruum.com with 27 Coupon Codes, and 24 Deals! Details: Get 30% Off Denim. Expires on 03/05/2014. Details: Shop the Last Chance for Summer Sale. Prices starting at $2.99. Details: Deep Discounts on Spring & Summer Apparel. Warehouse sale items can be found under each category in the "sale" tab. Expires on 03/15/2014. Details: Deep Discounts on Spring & Summer Apparel + Free Shipping Over $60 with no code required. Expires on 03/15/2014. 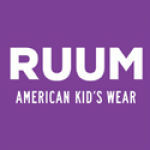 Details: Get 25% Off Your RUUM American Kids Wear Purchase with Our Best Customer Event. Ends 02/23/2014. Details: Get 20% off Entire Order + Free Shipping On Orders $60. Expires on 02/19/2014. Details: Buy any full priced bottom and receive 50% off second one of equal or lesser value. Limited time offer. Details: 30% Off Your entire American Kids Wear Order- Savings up to 75%. Expires on 10/03/2013. $1 flat rate shipping for a limited time. Details: $1 FLAT RATE SHIPPING for a limited time. Details: Take an Extra 50% off All Sale. No promo code needed. Prices reflect discount. Details: Get $2 Shipping Sitewide + Buy One Get One 50% Off All Bottoms, Including Sale. Expires on 02/20/2014. Details: Take extra 50% off on Sale Items from RUUM American Kids Wear + Denim Starting at $10.50. Expires on 03/05/2014. Details: Get tops for $2.99, Bottoms for $7.99 & Shoes for $9.99 + Take an Extra 75% off All Sale. Details: Shipping for $1 + Get up to 80% off. Expires on 02/04/2014. Details: 30% off Dressy and Shoes. for a limited time.